Belgium's march to the World Cup semi-final has united a country long split by political tensions between Dutch and French speakers -- while the players themselves often speak in English. Known as the Red Devils -- Diables Rouge in French and Rode Duivels in Dutch -- the team's success has seen houses decked with the young country's red, yellow and black flags. Officials and experts say it is a great source of pride for a deeply divided nation more used to relying on chocolates, beer and the royal family as symbols of a seemingly impossible unity. "The Red Devils today are the best calling card, a golden calling card for the country's image everywhere in the world," Belgian Prime Minister Charles Michel said on national radio. "And that injects dynamism into Belgium," said the French-speaking premier who also recognised the team's role in promoting "collective confidence". The fact that Belgium is playing its bigger neighbour France in Tuesday's match in Russia for a place in the country's first ever World Cup final can only deepen that unity, analysts said. France, on the other hand, won the championship in 1998. "There is still in France this arrogance about the little Belgians," political scientist Jean-Michel De Waele told AFP. Founded only in 1830, Belgium has throughout its short history been divided between Dutch-speaking Flanders in the north and French-speaking Wallonia in the south. There is also a small German-speaking community in the east. In the last decades, severe tensions across the linguistic divide in a country that hosts key global institutions such as the European Union and NATO, has seen it morph progressively into a federal state that devolves increasing powers to its language-based regions. King Albert II, who abdicated five years ago for his son Philippe, helped steer the country through several crises and avoid break-up. He played a key role to end its longest political crisis in 2010-2011 when it went a record-breaking 541 days without a government. But fears that the country could split have waned since the last World Cup in 2014, which was an election year in Belgium. In a bid to keep the country together four years ago, politicians "felt the need to attend matches, show their support for the national team," added De Waele, of the Free University of Belgium. Belgium's footballers are so culturally diverse that Belgians don't even bother "to speak about their origins". Most Belgians, he said, embrace as fellow nationals Marouane Fellaini, born in Brussels to Moroccan parents, and Romelu Lukaku, born in Antwerp to Congolese immigrants. They are stars along with Flemish player Kevin de Bruyne and Eden Hazard, the Wallonian captain. "The national football team transcends that (communal divide) which in my opinion is less true for the royal family," which is widely seen as closer to their native French-speaking community. Many of the royals have trouble speaking Dutch, who account for about 60 percent of Belgium's 11 million people. There are also republican sympathies in both the north and south. 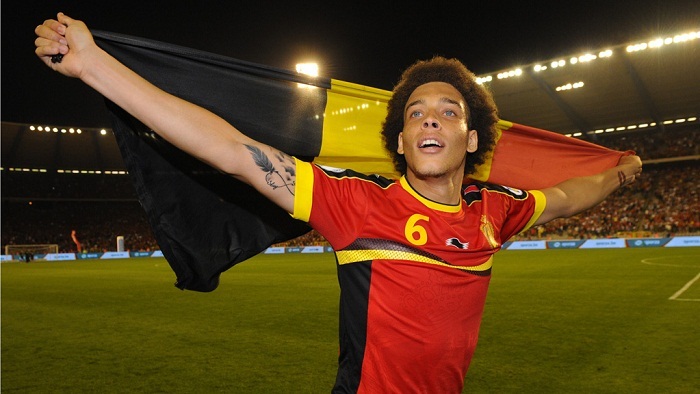 Football is a stronger unifying force even than Belgian pop superstar Stromae or the late crooner Jacques Brel. "In China three weeks ago, Chinese students asked me if Belgium was a city or a country, but these students were able to name the Belgium's 11 starting players," De Waele said. "That (football team) makes us realise that we exist for something else than beer and chocolate," he added. Economist and philosopher Philippe Van Parijs thinks the team is setting a powerful example for a country divided by language by using English as the lingua franca. Its stars play for English Premier League teams like Manchester City, Manchester United and Chelsea. "English has never been as present as now, both with the fans and the players on the national team," Van Parijs told Belgian television. "In my eyes, it's a really an irreversible phenomenon." The team's match in Saint Petersburg also tackles an inferiority complex felt in Wallonia, which neighbours larger France and is the top holiday destination for Walloons. "It's the chance to tell the French: 'You see, we are at the same level as you," De Waele said.